Contact inhibition of locomotion is a widespread phenomenon in migrating cells. However, cells often migrate collectively as a sheet, raising the question of how contact inhibition is overcome in these scenarios. A new paper in Development addresses this problem by studying the signals that regulate collective migration in Xenopus leading edge mesendoderm (LEM) cells. 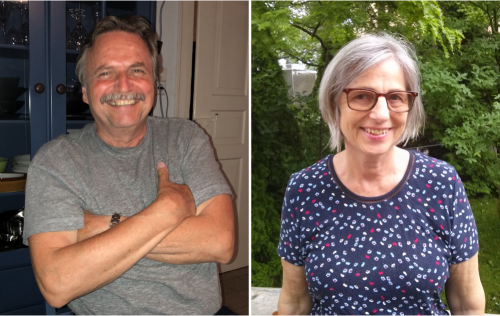 We caught up with the paper’s two authors Martina Nagel and Rudolf Winklbauer, Professor in the Department of Cell and Systems Biology at the University of Toronto, to find out more about the story. Rudolf, can you give us your scientific biography and the questions your lab is trying to answer? RW I did my PhD work at the MPI for Virus Research in Tübingen, now MPI for Developmental Biology, in the lab of Peter Hausen. I was the first graduate student in his lab who used Xenopus to study embryonic development, and I remained with the frog embryo ever since. As a postdoc in Ray Keller’s lab at Berkeley, I settled on my present research agenda: cell migration in the gastrula. Back in Germany, I led a small research group in Hausen’s Department at the MPI in Tübingen. From 1993 to 1999, I held an Assistant Professor-like position at the University of Cologne. It was non-tenure-track, and to keep me off the street afterwards, Peter Hausen offered me a Senior Researcher position at his Department. Since 2001, I am at home at the Cell and Systems Biology Department at the University of Toronto. As it turned out, almost every gastrulation movement in the frog embryo can be considered a cell migration process. The basic question is: how do cells migrate across and between other cells all the while they adhere firmly to each other to keep the embryo together? Naturally, with this question in mind, one becomes also interested in problems of cell adhesion and tissue mechanics. Martina, PubMed tells me you first published with Rudolf in 1991 – how did you initially come to work together, and what questions have driven your research since then? I was Rudi’s first graduate student, and my task was to find out how prospective head mesoderm cells find their target region as they migrate through the frog gastrula. Subsequently I studied also other aspects of mesoderm cell motility, but this primordial question is still my main interest. In that 1991 paper, you described how LEM aggregates formed oriented lamellipodia during their migration. What initially drew you to this phenomenon? MN That lamellipodia all pointed in the direction of overall mesoderm movement had been observed in the intact embryo. It had been the first indication that the cells could somehow sense the direction of their target at the animal pole of the embryo. We reproduced this orientation process in vitro to study its mechanism. RW Tina politely disregarded my enthusiastic attempts to supervise my first graduate student and, against my nicely laid-out plans, performed an elegant experiment which demonstrated that mesoderm cells are guided by cues in the extracellular matrix of the ectoderm. MN A major step in our understanding of the cell guidance mechanism was the identification of PDGF-A signalling as an essential factor in the process. We did this in collaboration with Karen Symes, Boston University. Our subsequent attempts to understand how PDGF-A actually functioned as a guidance cue led us to the current work. MN Outside of the embryo, mesoderm cells show contact inhibition of migration: if the lamellipodium of a cell contacts another mesoderm cell, it collapses, and movement ceases. 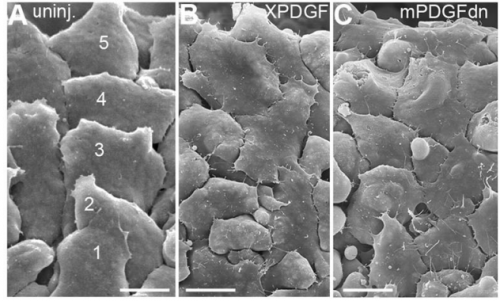 On the endogenous substratum, however, PDGF-A bound to the extracellular matrix suppresses contact inhibition, which allows cells to form long-lasting lamellipodia. In a way that we do not yet understand, this suppression of lamellipodia collapse is spatially biased, leading to the preferential survival of protrusions that point into the predetermined direction of migration. This potentially generates the uniform orientation of lamellipodia that was the starting point of our investigation. So you have pathway involving a series of inhibitory interactions linking Pak1 to ephrin: do you have any idea of the molecular basis of any of these interactions? RW Many eureka moments; too many! MN Ever so often, we thought we finally understood how the whole thing worked, until the next experiment gave us exactly the opposite result from what we had predicted. RW … after a while, this pattern changed, we more and more often predicted correctly what would happen, and gradually most of our observations found their place in the puzzle. MN As just mentioned: whenever a really cool idea went to dust after an experiment. RW Cell and developmental biologists have done an enormous job over the last decades, and so many facts and concepts are known now that are relevant to our work. This makes adding new results to the existing body of knowledge so complicated. Where we had to align two little known interacting factors for a paper thirty years ago, we now have to juggle a handful of them. And they all are known to do multiple things and to interact with multiple other factors. And where will this work take you? MN We hope that we will better understand how migration is guided by the substratum in systems where cells move as parts of a large, tightly coherent cell mass. RW We also fancy that we might identify a core pathway regulating contact inhibition of migration. By determining the position in the pathway of other factors that we and others have found to be involved in the process. We wonder whether such a pathway exists, or whether lamellipodia collapse is easy to get and regulated in different ways in different contexts. When you think about it more generally, cells being able to freely crawl around in the organism, to exchange places and to re-group is an essential part of what makes an animal an animal at the cell level. Green plants don’t do it, red or brown algae won’t, and so on. Fungi seem to try. And after all: it is animals who found out all this stuff about cell migration that we were just talking about. Finally, let’s move outside the lab – what do you like to do in your spare time in Toronto? MN Half the year it is winter in Toronto! RW Well, say a third of the year. And there are always books. This is #45 in our interview series. Browse the archive here.